W.H. 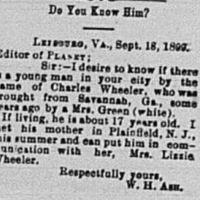 Ash is searching for Charles Wheeler on behalf of his mother, Lizzie Wheeler. 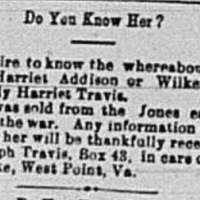 Joseph Travis is searching for Mrs. Harriet Addison or Wilkerson (formerly Travis), who was sold from the Jones estate during the war. 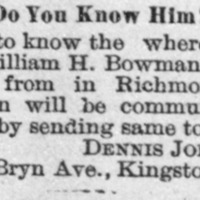 Dennis Johnson, Kingston, NY, searching for William H. Bowman. 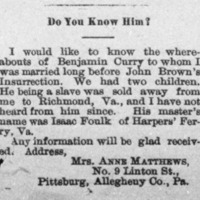 Last heard from in Richmond, VA.
Married "long before John Brown's Insurrection." 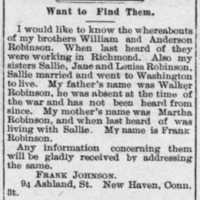 Husband, of Harpers' Ferry, VA [now Harpers Ferry, WV], sold to Richmond, VA. Has not heard from him since. Jane Coles was "a slave owned by Beverly Caesar." 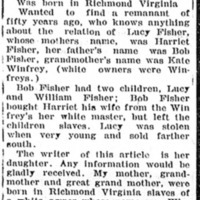 Daughter of Rhody Harvey. 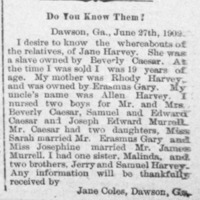 Sister of Malinda, Jerry, and Samuel Harvey. Jane sold at age 19.